"⇅" redirects here. For the quantum theory of electron spin, see Spin (physics). 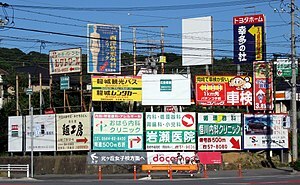 Advertising billboards in Japan featuring many different arrow symbols. The typographical symbol developed in the 18th century as an abstraction from arrow projectiles. Its use is comparable to that of the older (medieval) manicule (pointing hand, 👈). Also comparable is the use of a fleur-de-lis symbol indicating north in a compass rose by Pedro Reinel (c. 1504). An early arrow symbol is found in an illustration of Bernard Forest de Bélidor's treatise L'architecture hydraulique, printed in France in 1737. The arrow is here used to illustrate the direction of the flow of water and of the water wheel's rotation. At about the same time, arrow symbols were used to indicate the flow of rivers in maps. A trend towards abstraction, in which the arrow's fletching is removed, can be observed in the mid-to-late 19th century. In a further abstraction of the symbol, John Richard Green's A Short History of the English People of 1874 contained maps by cartographer Emil Reich, which indicated army movements by curved lines, with solid triangular arrowheads placed intermittently along the lines. Use of arrow symbols in mathematical notation originates in the early 20th century. David Hilbert in 1922 introduced the arrow symbol representing logical implication. The double-headed arrow representing logical equivalence was introduced by Albrecht Becker in Die Aristotelische Theorie der Möglichkeitsschlüsse, Berlin, 1933. Additional arrows can be found in the Combining Diacritical Marks, Combining Diacritical Marks Extended, Combining Diacritical Marks for Symbols, Halfwidth and Fullwidth Forms, Miscellaneous Mathematical Symbols-B, Miscellaneous Symbols and Pictographs, Miscellaneous Technical, Modifier Tone Letters and Spacing Modifier Letters Unicode blocks. This page was last edited on 14 March 2019, at 10:11 (UTC).